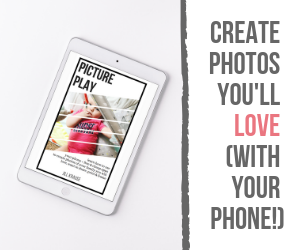 Do you subscribe to any monthly (or bimonthly) subscription boxes? 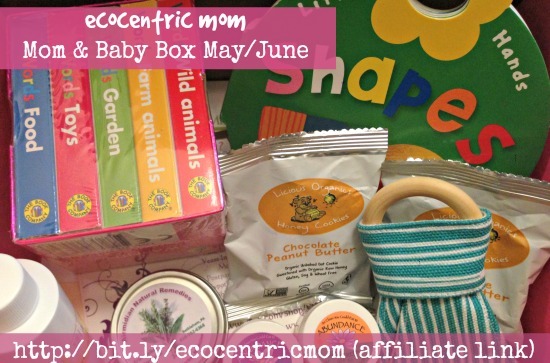 As part of their blog ambassadors, ecocentric mom sends me a box every-other-month so that I can tempt you all into subscribing. I don’t think there has ever been a box I wasn’t happy with. This month I received the “Mom & Baby” box again and I am pleased with the goodies hidden inside. For only $24 you will get a very similar box if you subscribe today! If you’re going on vacation this summer with your baby, this box if full of goodies to keep them entertained. AllieLou Baby Organic Teething Ring: Made from natural maple wood with no chemicals added and hand polished to seal and prevent splintering. The fabric ears are 100% GOTS certified organic flannel. ($8.50 per ring) Plus a coupon code for 10% off your next order from AllieLou. ~Just for Mom~ Licious Organics Raw Honey Chocolate Peanut Butter Cookie: Um, I just opened this cookie while writing this post and I am ready for another. It’s an unbaked raw cookie made with only the finest organic ingredients. Guess what? They are gluten-free, soy-free, and wheat-free!! ($1.20 per cookie; 2 included in my box) Plus a coupon code for 10% off your next order at NudeFood.com. Board Books: This month’s box has 2 different sets of board books for your little one! Words is a set of 5 mini board books for baby-3 yrs old. Shapes is a board book by a different company (MakeBelieveIdeas.com) and is manufactured with soy ink and paper from sustainable forests. Each set/book is valued at $9.95 and pushes the value of this box way over the price paid! I’d hate to ruin all the surprises for you so I won’t tell you about the natural sunscreen, night cream, and other salves and soaps inside the box. If you look really close in the picture you may be able to see them. Whatever you do, do NOT throw away the coupons and flyers without reading them!! I’m about to go redeem my $15 gift card for Kiss Me Organics Matcha green tea powder! !